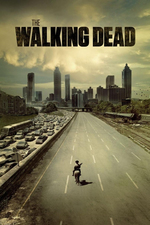 Episode 15 of The Walking Dead, “Try,” finds Alexandria at a crossroads. With the deaths of Aiden and Noah in the previous episode, “Spend,” loss and uncertainty reign. The Monroe family is mourning the loss of Aiden. Deanna puts on Aiden’s “Run Mix” and listens to Nine Inch Nails until Reg can’t take it any more. 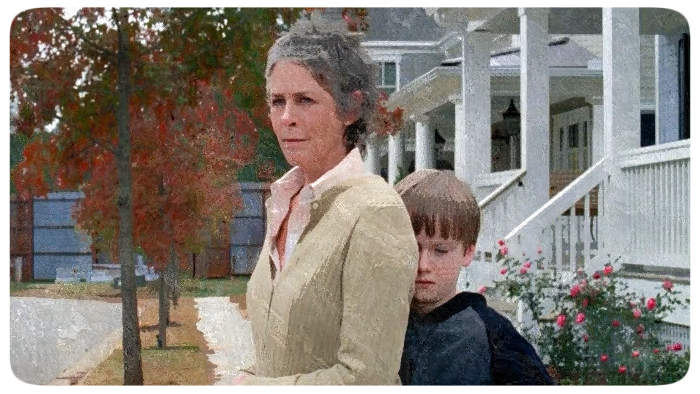 Carol makes a casserole for the family, which she leaves at their door. Deanna doesn’t seem interested in their casseroles or their condolences. Rick, Michonne, Sasha and the others are also mourning the loss of Noah, each in their own ways. In The Walking Dead, death is never as straightforward as a simple loss. In “Try” the deaths of Noah and Aiden have raised a lot of questions for both Rick’s group and the people of Alexandria. Aaron and Daryl are on the road looking for people to recruit. Aaron comments that there are more walkers around than there used to be. Daryl spots a light in the distance, indicating that people are nearby. Later in the episode, Daryl and Aaron come upon chopped up walker bodies. Daryl points out that the dismemberment just happened. They find a dead woman who has been recently fed upon by walkers tied to a tree. She has a “W” carved in her forehead. It appears that the threats to Alexandria are both internal and external, walker and human. Nick is making up a story for Deanna, blaming Glenn for Aiden’s death, as she records it for “transparency.” He tells Deanna, “These people have to go. They are not like us. I know you see it, too.” Deanna responds sharply, pointing out that she sees a great deal. Meanwhile, Glenn is telling Rick what happened. Rick points out that the people of Alexandria don’t know what they’re doing. Glenn seems worried at first that Rick is going to want them to go back to living outside of Alexandria. It becomes clear that Rick means something entirely different when he says, “But their rules, we don’t answer to them.” Glenn looks a surprised and says, “We are them, Rick. We are now.” Glenn points out that Noah believed in Alexandria, telling Rick that they have to make it work. When Nick asks Glenn if he is threatening him, Glenn responds, “No. I’m saving you.” Glenn has decided that this is how he is going to make it work in Alexandria, by telling Nick how things are going to be. We like it. Glenn may actually be saving Nick, but he’s clearly threatening him too. This freaks Nick out enough for him to go out and unearth a gun, which he’s hidden away for a rainy day. 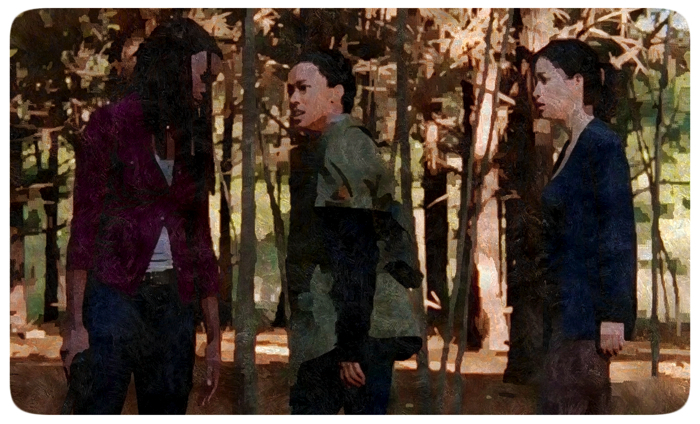 Michonne and Rosita find the walkers that Sasha has been shooting. Michonne says, “She’s hunting them.” Michonne and Rosita come upon her, and Michonne tells her she needs to leave. A group of walkers comes upon them and Sasha refuses to leave, instead wanting to focus on her walker revenge. They all end up fighting the walkers, which seems to be somewhat cathartic for Michonne as she remembers life outside of Alexandria. After they take care of the walkers, it’s clear Sasha’s pain runs deep. Sasha yells that they can’t help her. Sasha beings to cry and says, “Noah. I told him he wouldn’t make it.” Sasha mourns for Noah, but also for so much more. Sasha finally starts walking towards Alexandria. Rosita, and then Michonne, follow. 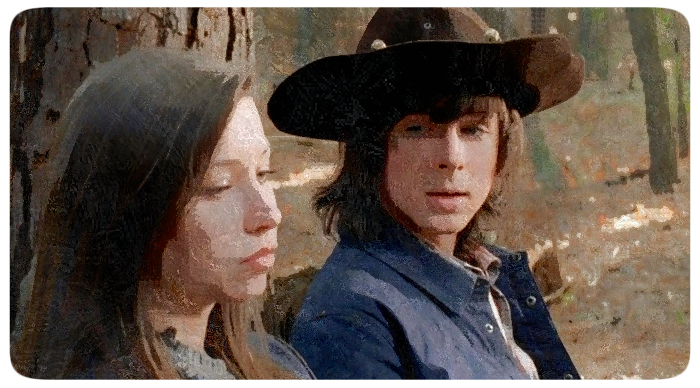 Enid catches Carl following her. She tells him to go back and that he scares her. Carl tells her it’s not safe to be out alone, reminding her that two people just died. Enid responds, “People always die. 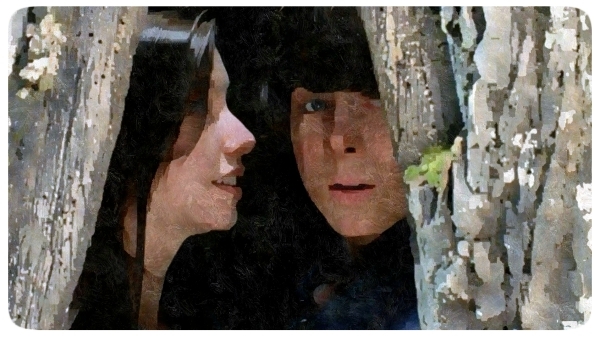 You know that.” When Carl asks Enid what she does outside the walls, she tells him, “Same thing as you.” Enid and Carl start to run around the woods, like kids. Carol asks Rick what he’s going to do about Pete. Sam has told Carol more about the abuse. When Rick asks her why she cares, Carol tells him that he knows why, and she tells Rick that she knows that he cares too. So obvi, Rick! Carol’s talk has had a chilling effect on Rick. He goes for a walk/stalk with his gun, and Pete appears. Bad timing, Pete. Rick has crazy eyes and tells Pete, “Keep walking.” Pete realizes he means business and goes on his way. This is the scary Rick we all love and fear. The next day Rick finds Deanna as she stands over her son’s grave. He tells her that Pete is a problem. She already knows about Pete, and doesn’t seem in favor of Rick’s solution to separate him from his family. She asks what they will do if Pete doesn’t listen, and Rick responds, “I kill him. We’ll kill him.” Deanna makes it clear that execution is not an option. 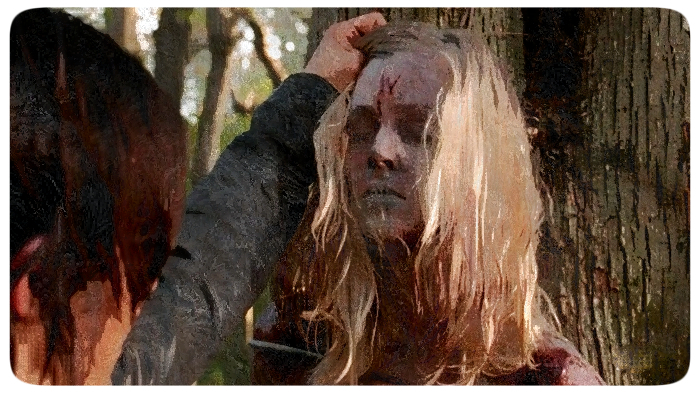 She tells Rick, “I wouldn’t kill you. 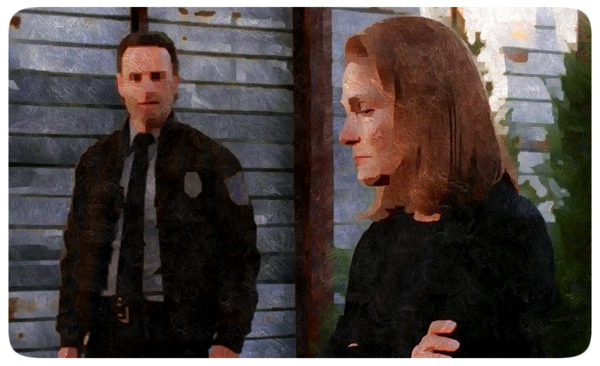 I’d just send you away.” Deanna may be showing too many of her cards to Rick. Jessie is smoking, but doesn’t want her kids to know. Rick reassures her, “Your secret’s safe.” Rick then informs Jessie he knows about Pete’s abuse, so clearly not all her secrets are safe. She insists that she can fix Pete. 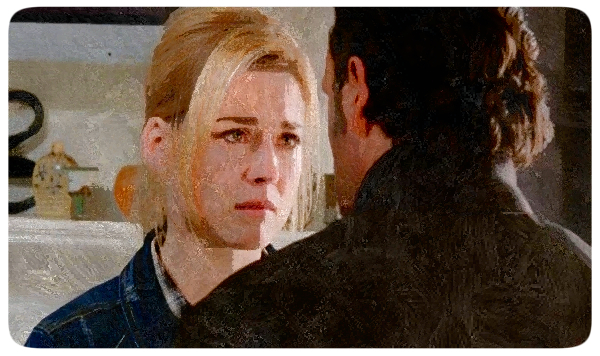 She tells Rick that he’s only going to make things worse. Rick responds, “If it’s gotten worse, it means he’s killed you. That’s what happens next. And I’m not gonna let that happen.” She reminds Rick she is married and tells him she can take care of herself. Pete shows up and tells Rick he needs to leave. Jessie says no, that Pete is the one who needs to leave. Pete gets all aggro with Jessie, and Rick tells Pete to leave with him now. Rick and Pete start fighting. They crash through the window and everyone runs into the street to see Rick and Pete trying to kill each other. Jessie and Carl try to intervene but are both knocked away. While he is strangling Pete, Rick sees the red balloon from earlier float up into the air. Deanna arrives and yells at Rick to stop, which, surprisingly, he does. Everyone stands around, looking at the bloodied Rick and unconscious Pete. When they move toward him, Rick pulls out his gun. He tells Deanna that none of them get it yet. Before Rick can say any more, Michonne knocks him out and takes his gun. Daryl (Norman Reedus) and Aaron (Ross Marquand) make an interesting scouting team. Aaron is comfortable with Daryl taking on the role of expert and understands the value of Daryl’s knowledge. In “Try” what we see again and again outside the walls of Alexandria are threats, both in terms of those who are carving up walkers and using humans as bait, and the increase in the number of walkers around. Rick may be doing the greatest disservice to Alexandria by distracting them from these external threats through his conflict with Pete. 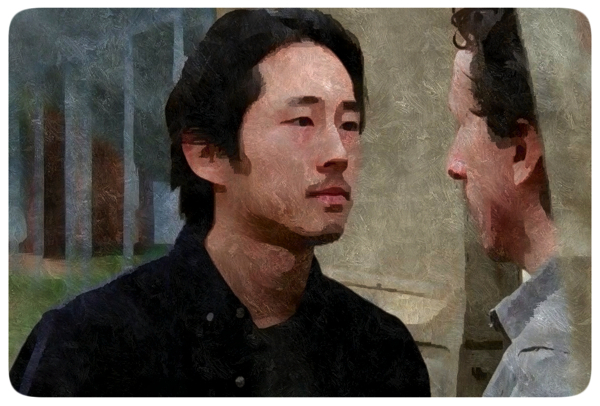 Glenn (Steven Yeun) remains a fascinating character with a steadfast moral core. He didn’t kill Nick (Michael Traynor) though he knew Nick would cause problems for him when they returned to Alexandria. Glenn is desperate to make things work in Alexandria despite being let down by the people. He wants to believe they are teachable. It wasn’t hard to predict that Nick would lie about what happened based on his other cowardly and self-interested actions. Deanna is a canny woman and we have hope she will see the truth of what happened. The confrontation between Glenn and Nick was the highlight of the episode. 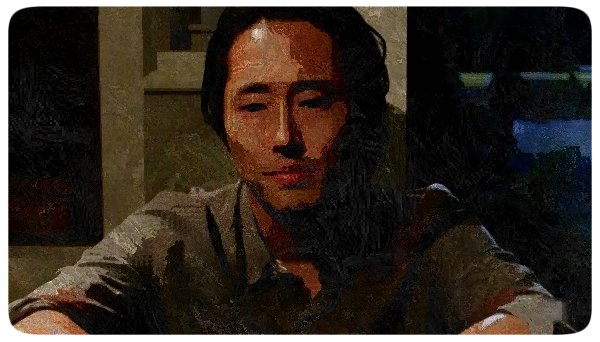 We loved it when Glenn said, “I’m someone who knows who you are. I know what you did.” Don’t let Glenn’s calm demeanor fool you, he’s a badass. 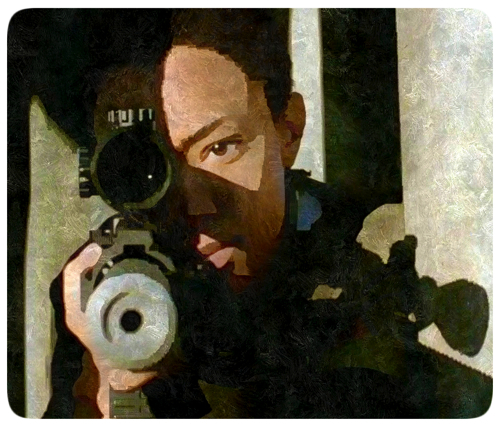 Sasha (Sonequa Martin-Green) seems to be losing it. She is probably right that no one can help her. She might still make it through on her own, but then again, she might get herself or someone else killed. The benefit of her passion for putting down walkers may have an up-side. Unless it causes a bullet shortage, her walker-killing rampage may be useful if their numbers continue to increase as they have been. As The Walking Dead speeds toward the season finale, we were given little time this episode to mourn Noah’s death, except through Sasha’s very emotional and well-acted scene. Michonne (Danai Gurira) has been the pushing to join Alexandria more than anyone else, yet in “Try” she begins to feel uncertain. She may wonder if Noah would still be alive if they hadn’t come to Alexandria. Perhaps she had unrealistic notions about Alexandria keeping them safe. By the end of the episode Michonne seems to have come down on the side of it’s better to be within these walls, resulting in her knocking Rick unconscious before his actions or words do any more damage for himself or his group. 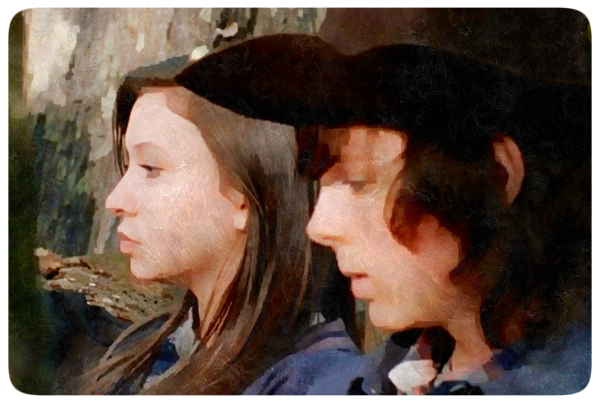 The Carl (Chandler Riggs) and Enid (Katelyn Nacon) storyline was suprisingly fun to watch. You can’t help but want these two kids to have some joy in their lives. The tentative way they begin to reach out to each other and nervously interact as adolescents breaks your heart and restores your faith in humanity all at the same time. The scenes between them brought some lightness to a very dark episode. For someone who believes in transparency and the social compact, Deanna (Tovah Feldshuh) doesn’t have a lot of faith in the people of Alexandria, or at least Pete, following rules. What kind of civilization is that? For all her intelligence and perceptiveness, Deanna doesn’t seem to hear Rick’s warnings about how dangerous other people are and how they will play upon your weakness. 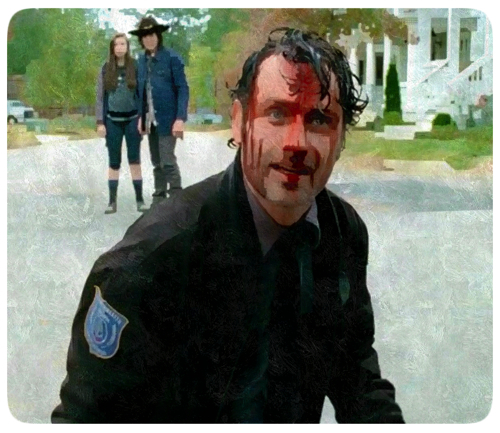 Deanna shows Rick (Andrew Lincoln) her own weakness—at least what Rick would perceive as a weakness—by saying she would merely exile him if he were a problem. Though Deanna’s strength does make her a very good leader, internal strife and outside threats will put her leadership to the test. Despite having a small part, Carol (Melissa McBride) was a powerful presence in this episode, from the way she coldly tries to manipulate Deanna with her casserole to the way she plays on Rick’s emotions to try to get him to kill Pete. Though we certainly believe that if things continue as they have been, Pete will kill Jessie, we’re not sure that this whole killing Pete plan is in Rick’s best interest. Rick has been impacted by Noah’s death and the possibility of losing more of his people. He may be going overplaying his hand in “Try” because he has limited power within the walls of Alexandria. Outside, people followed Rick with military precision, whereas in Alexandria he feels he cannot protect them because he is not in control. Certainly, it has caused him to expose his play to Deanna in terms of wanting to take over Alexandria. If Michonne’s reaction to Rick’s speech and Glenn’s “We are them” comment are any indication, it seems like Rick’s plan would garner little support from his own group. Next week’s episode, “Conquer,” is a 90-minute season finale. Let’s hope they don’t end up in another train car. “From Michonne’s reaction to Rick’s speech and Glenn’s “We are them” comment, it seems like Rick’s plan would garner very little support from his own group.” And this has been an issue since Aaron first introduced himself: there’s growing division within our ragtag group of roamer killers and Michonne’s knocking out Rick would be a good way of saying ‘Hey, we’re not as crazy as Rick.’ Yeah, Carol once said that even when Rick is wrong, he’s right, but waving around a gun, fighting Pete in a public space, talking about how much his way is right- not a good way to win supporters. Not to mention that the route Rick wanted to take to Alexandria was littered with walkers and nearly got him, Glenn, Aaron, and Michonne killed.